Well I promised to write it up for SCBWI BI so I took pages of notes at the 2011 Bologna Book Fair's first ever Tools of Change for Publishing Conference entitled "The World of Storytelling is Changing". Big thanks to Bologna's Roberta Chinni and Neal Hoskins, of Winged Chariot Press who specializes in beautiful children's translated picture books for organizing this new conference. Big news at the Fair afterwards by the way, in case you missed it on the Bookseller, was that WInged Chariot has joined forces with Walker Books. But how to sum up so much talk in a digestible nugget for all of us time-skint skim readers? Everyone will have a different angle but I'll start slowly with O'Reilly Media's Joe Wickert who welcomed us early last Sunday morning. Early television, he said, took a while to develop its own identity, distinct from the radio format it began by emulating. Now similarly we are witnessing the early days of a new form of media. That said, we are still all about storytelling. Hum. If there was a story to this day, it was a opening chapter with many paths to follow and no sign of a neat plot or ending. The main characters in Bologna were book publishers and digital developers looking at the marketplace, sharing their experience from their many different perspectives, and deciding how to come to terms with new publishing formats and tools that are still evolving rapidly. With this inevitably comes jargon. From e-pub to android devices and more. But first, there's a clear difference between e-books which at their simplest are basicially scrollable PDF files of printed books, and apps - applications which can take an enormous variety of forms, not just games or enhanced books. I wonder how many 'primary content providers' - authors and illustrators from the children's book industry - were there? Why did I go? On a personal level, because I've got an app project of my own, and I was curious to go back to the Future having experienced the pre history of CD Roms. After my first children's books were published in the 1990s, I landed a rare salaried job in Paris,brainstorming and storyboarding ideas for 'quality' CD-Roms for children. I think I did better than the company investors. They paid for my first Mac. Once that bubble burst two or so years later, I was happy to return to books and magazines. But I still have a few of the best, authored CD-Roms on my shelf, by David Macaulay, Claude Delafosse and Roman Victor-Pujebet who paved the way for now, pushing the constraints of that medium to imaginative and playful levels. I was curious to see if there was any connection. Of course CD-Roms are the skeletons in the cupboard. No one in publishing wants to be reminded of the time and money wasted on them. Nevertheless, we did learn a few things about that overused word, interactivity. We learnt for a start to be dismissive about the worst excesses of "click and chirp" animation that children quickly tired of, way back, and seem to be resurfacing in digital books at the touch of a finger on the screen. But this wasn't the time or place to discuss content - and the quality of interaction - at any length. Everyone is still dealing with rapidly changing parameters, the tools, as O'Reilly rightly says, but just the tools, of change. So here are just a few key notes I made...and if you want more, or want to correct me, please fire away! Keynote speaker, internationally-known UK publisher Kate Wilson started us off with an impressive battery of facts, figures and market studies. She founded Nosy Crow a year ago and it's growing strong. Their Three Little Pigs app is now out, and Cinderella is on its way, alongside their book list. Her recent statistics revealed the sharp rise in digital book buying in the US, with the UK lagging behind, though still slightly ahead of the rest of the world. She talked of traditional book buying going down in the UK mainly due to TV. But can my notes be right? Does the average UK child really watch 2 hours of television a day? The increase in online buying of books means less impulse buying which is one reason for lower sales. Book stores, she said, need to think about how to create a greater experience to attract customers. 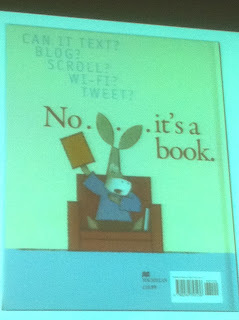 But how to attract people to digital books? You can't ignore the power of free and cheap so she believes in creating "lite" versions as tasters to tempt people to buy and download the full version later. Most other publishers referred to the need for buyers to sample free 'hooks' or tasters. Social media like Facebook are increasingly important for promotion. Authors who WERE interested in digital books need to be aware of their own role in this. But there is also a rise of niche critics - the mavens - offering a new source of opinion,"uncorrupt real people on independant forums whose opinion you can trust ". The gatekeepers are changing too. I'm glad I attended the popular breakout session "The Co-Production Model. Best Practices for Collaborating on eBook and App development " because it was the first time that day I'd heard the name of a specific author-illustrator. This was Lizbeth Zwerger, whose Little Mermaid has been developed digitally by Umesh Shukla of Auryn Inc in a beautiful co-release with Michael Neugebauer, founder of Mineditions and formerly of North South books. I had stumbled upon Auryn/Minedition's app Teddy's Day a month ago and bought it because it looked warm and intriguing. I wasn't disappointed. There were a lot more than "tap and chirp" in the interactions I found in Teddy's room. For example, you could paint a picture you in a little sub activity of the story, and then see it appear reduced at the back of Teddy's room, pinned up on the wall. Of the other breakouts, I thought the Moms with Apps presentation the most clear and interesting. This is a loose group of independent creators in the US, mothers, fathers, teachers so passionate about educating their children, during a period of educational cutbacks, that they have all created apps of different kinds mostly to make learning fun in original ways. Though lacking the track record and backlist of book publishers, the focus of their work is children, including those with special needs, more than financial gain. Their group site is worth looking at and you can now download an app which is actually a catalogue of all their peer-approved apps. Martin Salisbury's afternoon keynote, Digital Picturebooks, An Artist's Perspective, was a feast after all the flow charts. Professor of Illustration for the MA Children's Book Illustration at the Cambridge School of Art and author of some great books about illustration, he described himself as a dinosaur in the digital world, showing some great examples of interaction in the traditional picture book form. He raised some questions as to content. Could narrative structure and the new idea of interactivity be opposing forces? How will we fill those gaps between pictures or page turns that leave us a space to imagine in the way that Scott McCloud describes so well in his Understanding Comics? He stressed how vital it was to think of this digital book or app, creatively, as an entirely new media. I agree! Can it text? Blog? Scroll? Perfect prelude to the days at the Fair, about which more later! And big closing news from Roberta Chinni. Next year there'll be two new Bologna awards - one for an ebook and one for an app. Watch this space content providers!